Its me ...Piali , today I have an"Inspired by" project to share. I really loved the design!!! My layout is about my puppy playing in snow.....KOKO loves snow!! Loved the vellum butterflies in the original layout....I used the vellum for my snowflakes. 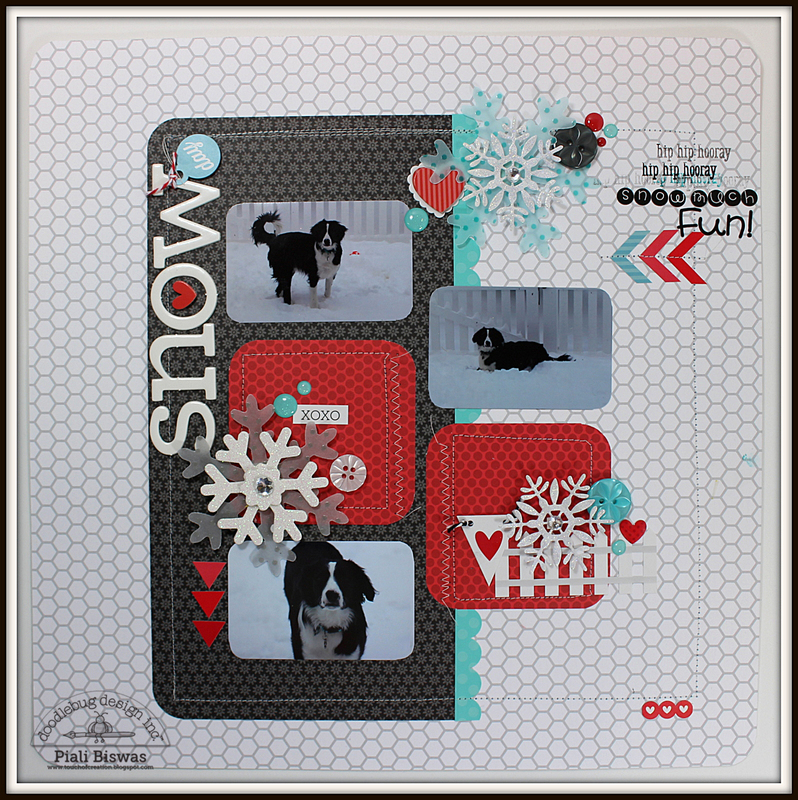 I also used Doodle Pop -Snowflake , Fancy Frills, Twine, Boutique Buttons and Sprinkles to embellish the layout. I used LILY WHITE CHIPPERS and TEENSY TYPE LETTER Stickers for my title and journaling. Hope you like my "Inspired By" layout! Thanks for offering the wonderful prize at Scrapbook & Cards Today. OMG your LO is absolutely lots of fun! Love you pics of Koko they are so cute you definitely got great shots and did an outstanding job scrapping them! The The the papers you used it's neat. How that one paper looks like a link fence also love all your embellishing ideas you are a very talented scrapper. TFS a I really enjoyed seeing it! YOU ROCK!! Both layouts are awesome! I adore the stitching and how you've used the vellum! TFS! SO cute! Great page and love the colors! I really need to dig out my sewing machine...your stitching looks so fun! LOVE your layout Piali ... LOVE Kathy's too!!! Loving the cleverness I see here!! 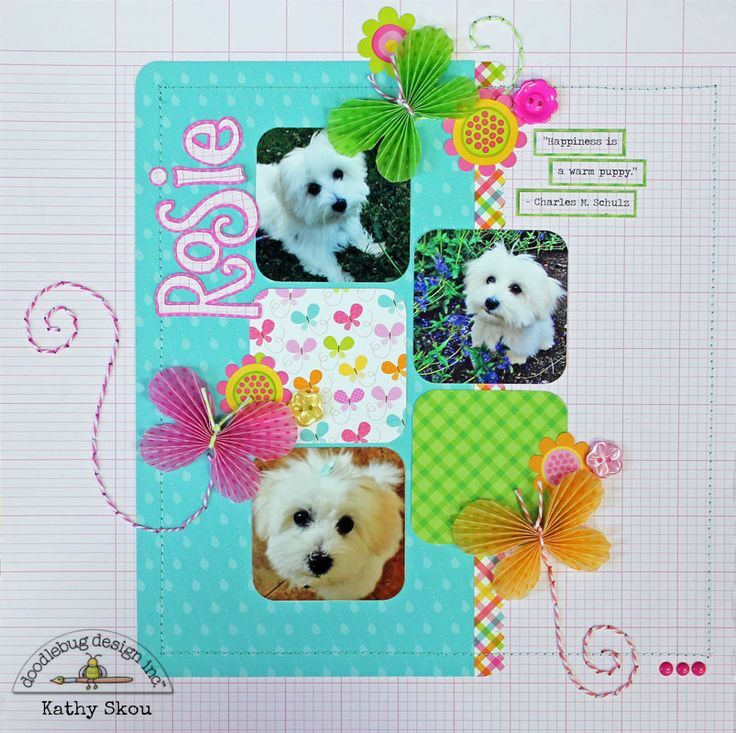 Kathy is one inspiring scrapbooker and I love that you chose one of her pages to do!! What a marvelous job keeping the set up pretty much the same - LOVE the change from butterflies to snowflakes and the colors are perfect on both layouts!! Just amazingly done! !